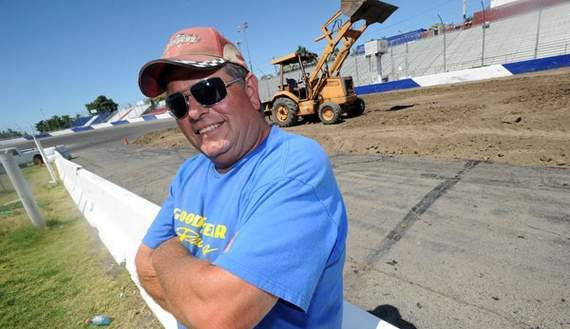 Stockton 99 Speedway promoter Tony Noceti oversees the track's transformation into a rodeo arena earlier this week for Saturday's Charreada a Mexican-influenced rodeo. STOCKTON - The speeding cars that normally inhabit Stockton 99 Speedway will be replaced by several tons of cattle, as track promoters Tony and Carol Noceti get into the rodeo business for a day. The track will host its first Charreada beginning at 4 p.m. Saturday with a concert scheduled at 6 p.m. A Charreada is a type of rodeo developed in Mexico that features bull riding, performing horses and festivities. Last year, country singer Bo Bice performed at the speedway, as the Nocetis want to bring more alternative events to their facility. "We're trying to reach out to other segments of the population in San Joaquin County, and bring in stuff that people will be interested in," Tony Noceti said. "We want to be about more than just auto racing, and this is a good step. We think a lot of people will come out and check it out." A temporary rodeo arena has been built on the front straightaway of the track at the start-finish line. Trucks brought in piles of dirt earlier this week to fill a bull ring 60 feet wide and 100 feet long with dirt 2 feet deep. The pit area will be turned into an arcade and midway with games, rides and a mechanical bull. After the rodeo, five bands will play, including headliner Rogelio Martinez. "It's going to be a great show," said Marcos Ambriz of MASntertainment, a local promoter helping the Nocetis with the event. "We have some outstanding acts." The bulls, horses and rodeo arena will be provided by Dennis Borba, an Escalon resident and professional bullrider who supplies the talent for many local rodeos. He said he will be providing tough bulls for a group of talented riders. "My bucking bulls are professional bucking bulls. They go all over California for American rodeos and Mexican shows," Borba said. "We'll have top riders, and 70 percent of the riders will be Hispanic for this event. (The crowd) is going to see a top-notch rodeo." Noceti said he's counting on good competition and a family-friendly event to bring in a good crowd, and then he'll decide if there will be additional Charreadas at Stockton 99. "We feel really good about the potential of this event, and we'll see how it goes," Noceti said.